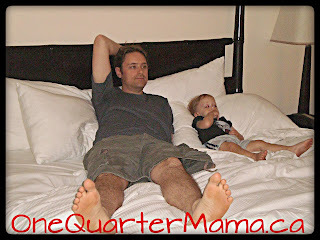 One Quarter Mama: #WondrousWednesdays - Dada! I live in Montreal with my wife Kelly and our four year old son. I run My Secret Atheist Blog (MySecretAtheistBlog.com), am pretty sure I probably have some form of ADD (not yet diagnosed), work in the medical field, and I have degrees in Computer Science and Classics. I was very Catholic but now an Atheist and rather angry at Catholicism and religion. Thankfully I have a blog in which to vent! Serious communication problems can sometimes occur. It’s fairly normal for family members’ brains to work differently, but when you have a family where likely everyone has a disorder that can affect communications, there is no baseline with “normal” at all. The real challenge is to remember not to read extra meaning into what Kelly says, and for me to communicate how I feel, which often means stopping to try to figure out what I feel. The more my wife and I have begun to understand ourselves and each other (through books and the Internet), the easier it has become for us to understand each other and to realize we’re actually all a very good fit for each other. There is never a dull moment in our house because we have a house full of very original thinkers! My son is probably the happiest and most vibrantly alive person I know. He is brimming full of life and enthusiasm - more so than any child I have ever seen. What may seem mundane to most people fascinates him. The Little Man speeds through life as if every second counts. I hope he never loses this sense of wonder. My wife is the most honest person I know who always tells things like they are. The only mind games going on between us are the ones I will occasionally project into the meaning of the words she uses. What’s one thing you want people to know about your family member’s disability that many don’t seem to understand? That although my son is autistic, he’s not stupid. Although he may not appear to be listening, he can still hear. And although he may have problems expressing himself, he still has important things to say. I think there is this misconception that because he is autistic and doesn’t always appear to be listening that he cannot hear or understand what’s going on. This is far from the truth. Even I am guilty of thinking this way. Before he got his iPad I didn’t have a grasp of just how much he knew. It wasn’t until I saw him easily completing all the puzzle games and challenges in his apps and actually excelling far beyond what one may expect for his age that I realized just how intelligent he really is. Now that his verbal skills are better this isn’t so much of a problem, but it does give me pause and make me reconsider how difficult it must be for those who have challenges speaking or expressing themselves yet have no intellectual disability. I find writing really therapeutic, andI feed the activist in me by writing as well. I believe my blogging helps the atheist movement and the atheist community here in Canada, and may help to inform readers in other countries as well. 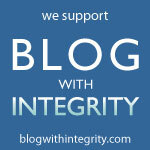 I also use my blog to support a small Secular Humanist primary school in Uganda. So far, using the blog as a platform, I have managed to raise enough money to provide a chicken coop to help bring eggs and meat to the children. I have also helped them purchase new land for a permanent home for the school, and helped them bring electricity to the new land through fundraisers partnering with Atheist Alliance International. Right now I am trying to raise enough money for the school to begin building classrooms on the new land. On the weekdays I wake up having had not enough sleep. It has to do with my early morning schedule. On the weekends I wake up to a four year old lying on my chest and breathing into my face, telling me it’s time to wake up. I can think of many worse things to wake up to than a smiling child though. I have a few right now. I like to write on my blog, play with my son, watch television and spend time with my wife. When it comes to junk foods, I love them pretty equally. Pizza, rotisserie chicken, hamburgers, American Style Chinese food. You name it, I love it. Do your best to live in the moment and not worry too much about things you have no control over. I have so little time outside of work and home that most of it is filled with me indulging my thirst for writing by blogging. But I do enjoy reading the Ramblings of Sheldon. He’s an ex IFB Christian who now considers himself agnostic. He also suspects he may be autistic. I’ve also been following Conor Robinson’s blog, Godless Pilgrim (http://pathfindersproject.com/conor/). He’s the head of a group of humanist Pathfinders who are sort of like a secular Peace Corps.